It's called the aerospace blast-down effect. Lew Racing's new PRO VT-1 Rims combine a newly-developed aerospace manufacturing technique called DEX-LCM with an exotic boron/carbon hybrid material to produce the company's new PRO VT-1 rims. What's it all mean? You can purchase the same technology used to make the PRO VT-1 880gram Wheel set for a fraction of the price. The 16/20 spoke configuration is compatible with many road hubs and with some lightweight spokes you have a sub 1,000gram wheel set for about $2,000.00. The PRO VT-1 Rims Retail for $800 each and when you buy a set they come with padded wheel bags! An incredible low-drag airfoil like no other rim on the market. Rims that are dynamically balanced and manufactured to conform to aerospace and strict DOD standards. 6/10 compression ring in the spoke face with no center-line seam which translates into absolutely no spoke pull-through. Rock solid sidewall construction guaranteeing no sidewall deformation from high spoke tension. Swirl Generator Lip on the spoke face which helps to re-attach separated airflow in cross-winds. A boron brake track covering an aluminum honeycomb mesh that acts as a heat sink and wear indicator for precision braking. A special Tri-Lock Channel for precise tire fit. Lightweight: guaranteed under 300 gram rims. "I'm always researching ways to make my wheels not only lighter, stronger, faster and more durable but also wheels that give a great ride. With the PRO VT-1 I believe I have developed an incredible rim that is not only perfect for racing but for everyday riding," says Paul Lew. For more information call Lew Racing at (702) 743-5508 or go to www.lewracing.com. Paul Lew began designing and manufacturing bicycle wheels in 1991. 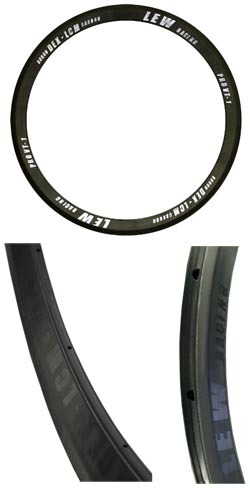 Eleven years ago he developed the Race Lite, a 34 Msi carbon rim  the first and original unidirectional carbon fiber rim. Lew introduced his hybrid 34 Msi and 43 Msi carbon Sub One wheel in 1998 as the first production 1000 gram wheel set. Mr. Lew boasts over 17 years experience in advanced product design, advanced composite materials and manufacturing processes. Besides being President of Lew Aerospace, he remains Chief Engineer of Lew Racing. He continues to lead the company with design and manufacturing innovations ensuring Lew Racing's demanding customers' expectations are not just met, but are exceeded. Lew Racing's Pro VT-1: The lightest production wheelset in the world...880 grams or less GUARANTEED.